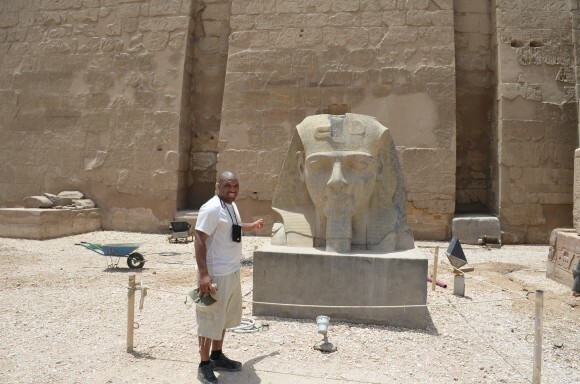 Black History Month: My Journey to Egypt | New Growth Hair Magazine | We capture the culture of urban barbershops and beauty salons. In the third grade, after seeing a picture of Khufu’s pyramid, my fascination with Egypt began. As a child, I watched every ancient Egyptian related video and documentaries that I could find. At age 13, I had a life changing experience, when my aunt took me to The Great Black Wax Museum in Baltimore, MD. It was at this black history museum that I was enlightened about Imhotep, the original father of medicine who was an ancient physician, architect, engineer, and advisor to King Djoser. In 2005, I traveled to Mexico to see the ancient Mayan sacred sites which included a pyramid. I was completely amazed to see and learn about the Mayan culture and sacred sites. Chichen Itza is the name of the grand pyramid that I saw in Mexico. The base of Chichen Itza was exactly the same size as Khufu’s pyramid in Egypt. After returning to America, I was on a quest to find out if it was possible for long distance ancient travel between Egypt and Mexico. After reading two of Anthony Browder’s books entitled From The Browder Files and Nile Valley Contributions to Civilization, I learned that the name Egypt was a Greek word which means the land of the burnt skinned people and the original name for ancient Egypt was Kemet (KMT). Browder referred to ancient Kemet as the cradle of civilization, the origin of western civilization, and the origin of the three major world religions. Also, Browder helped me to connect the dots between the ancient Egyptians and the ancient Mayans by directing me to read Dr. Ivan Van Sertima’s book We Came Before Columbus. In the book, Dr. Van Sertima, an anthropologist and linguist provided evidence of long distance water travel between ancient Egyptians/Nubians and ancient Olmecs (a culture that pre-dated the Mayans). Later, I learned that German scientists discovered tobacco and cocaine in the hair and skin of ancient Egyptian mummies. For me, this confirmed long distance water travel between ancient Egyptian, Olmec, and Mayan cultures because cocaine and tobacco was not available in Ancient Egypt. After reading Browder’s books and watching his YouTube videos, I made a commitment to myself to travel to Ancient Kemet. In April 2014, I took a 6,123 mile journey from Charlotte to Cairo. During the 12 hour flight from New York to Cairo, I wondered about how I would be treated. Would I be treated like a stranger or would I be treated like an African who now lives in America? It wasn’t long after I landed that I found my answer. When I arrived in Giza to see Khufu’s Pyramid and Heru-em-akhet (The Sphinx), I was greeted by a brown skinned young girl who said “Welcome Home African, you have my color!” as she pointed to her skin. In that moment, I completely embraced the term African-American. Throughout my entire time in Kemet, no one thought I was an American, the locals called me African, which was music to my ears. Due to the perception of political instability, many of the ancient sites experienced a huge decrease in visitors. I felt like a VIP because I didn’t have to wait in long lines and I had some of the sacred sites all to myself. I ventured into Snferu’s bent pyramid alone and I had the bottom of Dendera Temple all to myself. During my nine days in Kemet, I spent most of my time in Nubia (southern Egypt), which felt like home because many of the Nubians looked like my relatives. After talking with the Nubians, who referred to me as their distance cousin, all confusion about who was responsible for planning and building all of the ancient Kemetic (Egyptian) wonders was resolved. I am certain that Ancient Kemetic (Egyptian and Nubian) history is Black History. 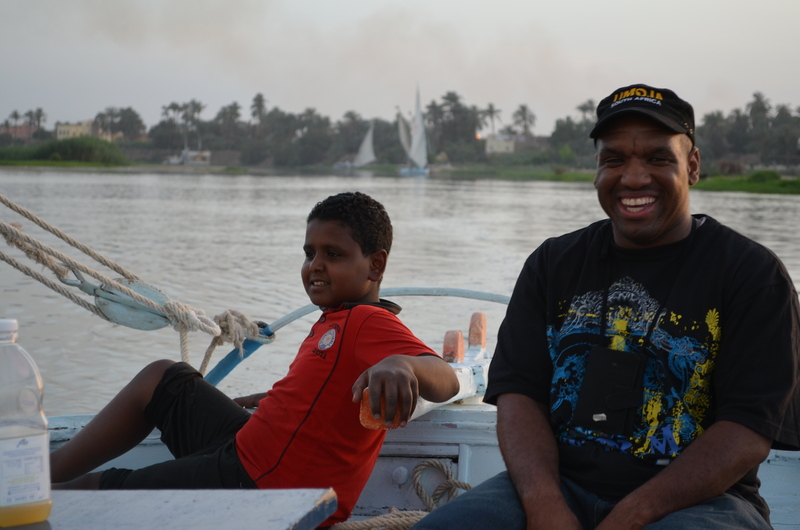 Rashad sails the Nile with his Nubian cousins.